Do all planets orbit in a flat plane around their suns? 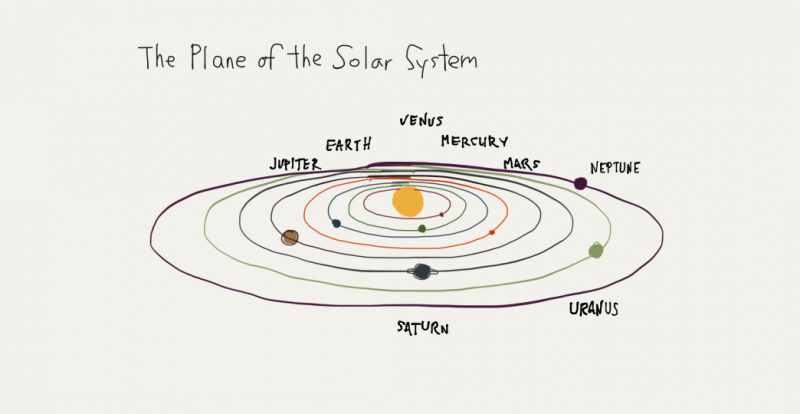 The major planets in our solar system orbit, more or less, in a single plane. That’s why you can look for them along the same sky path traveled by the sun and moon. Is the same true for exoplanets in distant solar systems? 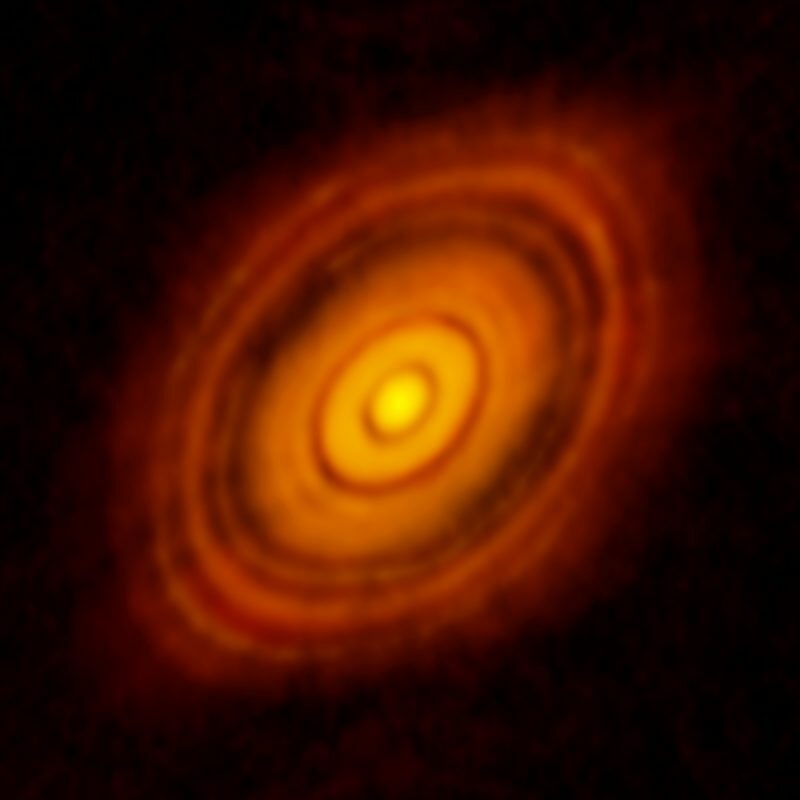 ALMA has acquired some amazing images of protoplanetary disks around young stars, like this one for star HL Tau. You can see multiple rings and gaps. Presumably, planets are forming within the rings, and the gaps are formed as the planets sweep their orbits clear of dust and gas. Image via NRAO. The earliest stargazers noticed that the bright planets in our sky travel along the same path, more or less, as the sun and moon. We call that sky pathway the zodiac. Today, we know this sky path – this zodiac – results from the fact that the planets in our solar system orbit our sun more or less in a single plane. But today we also know thousands of other planets – called exoplanets – orbiting distant stars. Do they also orbit, more or less, in a single plane around their suns? 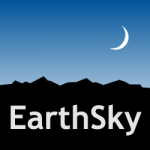 If you stood on the surface of an exoplanet (assuming it had a solid surface to stand on), would you also see that system’s planets cross the sky in approximately the same path as the local star? The answer is yes … and no. Keep reading. Here’s the yes part of the answer, beginning with another astronomy definition; the Earth-sun plane is called the ecliptic. Most major planets in our solar system stay within 3 degrees of the ecliptic. Mercury is the exception; its orbit is inclined to the ecliptic by 7 degrees. The dwarf planet Pluto is a widely known exception to this rule. Its orbit is inclined to the ecliptic by more than 17 degrees. It makes sense that most large planets in our solar system stay near the ecliptic plane. Our solar system is believed to be about 4 1/2 billion years old. It’s thought to have arisen from an amorphous cloud of gas and dust in space. The original cloud was spinning, and this spin caused it to flatten out into a disk shape. The sun and planets are believed to have formed out of this disk, which is why, today, the planets still orbit in a single plane around our sun. A drawing depicting the flat plane of our solar system. Not to scale! Read more: Train your Brain – See the shape of the solar system by Daniel Cummings. According to astronomers, distant stars and planets also form from spinning clouds of gas and dust in space. In recent years, astronomers have captured images of some protoplanetary disks – new solar systems in the process of formation – plus they see distant, already-formed solar systems, whose planets do orbit, as ours does, more or less in a single plane. 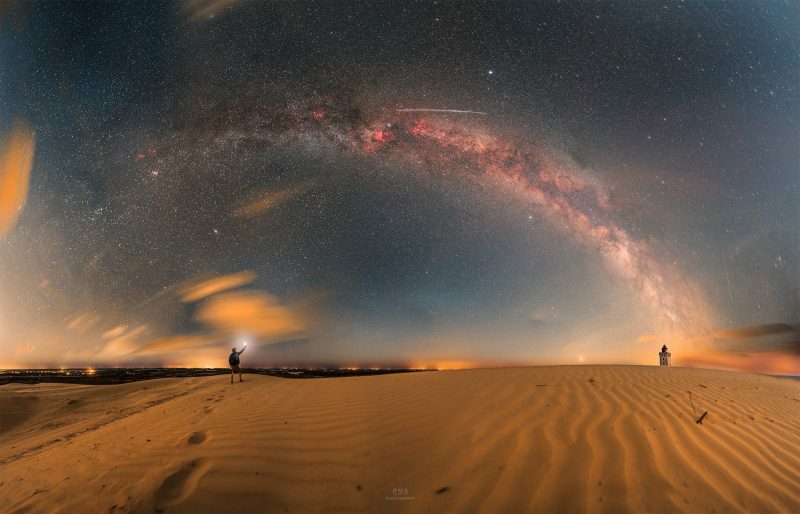 On these worlds, yes, you would see planets crossing the sky along a pathway similar to our zodiac, the same pathway traveled by the local star. On the other hand, it seems, astronomers recently learned that not all planet-forming disks lie in the plane of their stars’ equators, as our solar system’s must have. 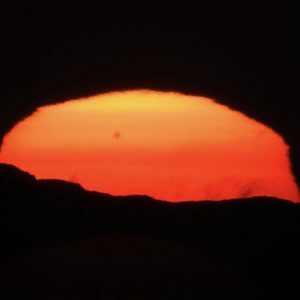 In early 2019, astronomers announced a newly discovered double star system where the planetary disk has somehow been kicked up over the expected equatorial plane, and now appears oriented over the plane of the stars’ poles. So, as always, Nature proves herself to be various and variable. 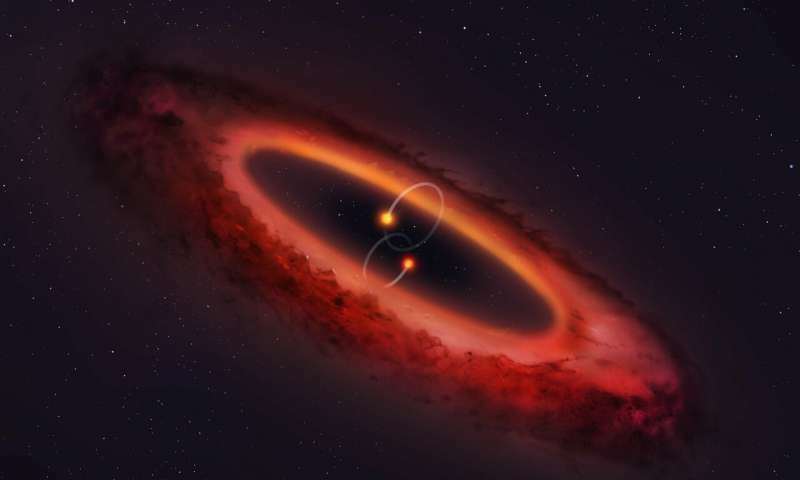 Artist’s concept of a view of a double star system and surrounding pole-oriented planetary disk. Image via University of Warwick/Mark Garlick. Read more. By the way, it’s one of the wonders of nature that our universe is populated with many sorts of disk-like structures. Rings and disks are common in astronomy. When a cloud collapses, the conservation of angular momentum amplifies any initial tiny spin of the cloud. As the cloud spins faster and faster, it collapses into a disk, which is the maximal balance between gravitational collapse and centrifugal force created by rapid spin. The result is the coplanar planets, the thin disks of spiral galaxies, and the accretion disks around black holes. It’s not just the planets in our solar system that orbit in a flat plane. Our Milky Way galaxy lies in a flat plane, too. That’s why we see the Milky Way as a starry pathway across our sky. Image via Ruslan Merzlyakov of RMS Photography. He calls it The Star Catcher. Read more about this image. Bottom line: Because of the way stars and planets form, most planetary systems likely start out in flat disks around their stars, orbiting in more or less the same plane as their stars’ equators. But we don’t know yet what becomes of these disks, and we know at least one example where a planetary disk has flipped upward, to become oriented over its stars’ poles.